Laurel’s creative community gets a home. Successful businesses are built on the concept of identifying a problem and finding the best way to solve it. In our case, we were continually coming into contact with folks who had big ideas, developing talents and a heart for growing something new. But, they usually existed within a bubble – a lone-soldier in the fight to make it matter. We worked with a local developer to renovate a unique and inspiring space in Downtown Laurel to serve as a home to its creative and entrepreneurial community. But, one major challenge remained – how to educate the community on the purpose and model of a coworking space. Hosted by Laurel Main Street, we released a Facebook Live video tour of the nearly-completed space. The video eventually went on to reach over 18,000 people in the area, and jump-started conversations about the power of coworking for small communities, and the necessity of supporting creatives and solo-entrepreneurs in order to help grow a town. 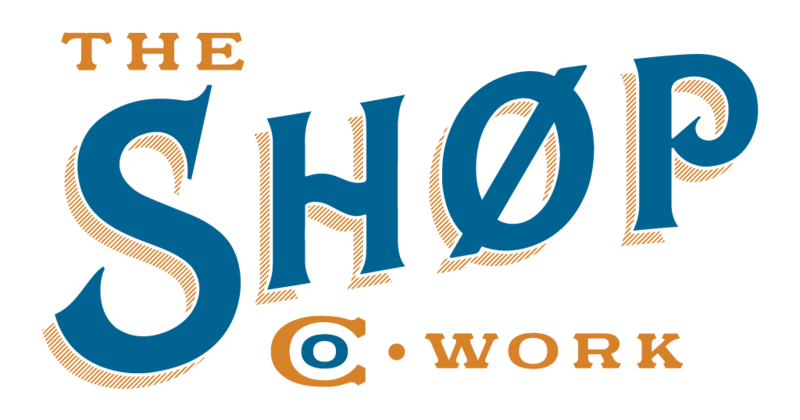 The Shop Co.Work brand needed to represent more than a fun place to work, or the visual style of the space. It needed to stand for the history of entrepreneurship in our town, for the people who we now look to for inspiration and the drive to keep pushing forward. We created a brand to represent the two most prosperous eras in Laurel’s history – the 1920’s and 1950’s. Then, we isolated the Co. in the brand to represent the spirit of our community, the concept of coworking and the companies we are building from the ground up. Something new for a new concept. Our website needed to be clearly inspired by technology and creativity, in order to appeal immediately to those who are most drawn to the coworking concept. We utilized pattern and unique page structuring to answer their most pressing questions first, and to visually communicate the experience of working in the space. Using large, simple imagery and custom-designed headlines, we were able to quickly communicate the most important information and lead visitors to the information that is most important to them. For those less familiar with the concept, we included the definition of coworking and extensive “frequently asked questions” in order to reduce confusion and to help our visitors fully grasp the value and purpose of the community. After the release of the launch video, we had several months of construction delays that began to stifle the excitement we had worked to achieve. We began to seek out ways to help spark the conversation again, and were helped along by a local publication writing a feature on the space and our founders. Then, when the space was finally complete, we were ready to open the doors to memberships and invite our community into their new home. We opened membership to our large email list with a 48-hour launch special on memberships. One day later we opened membership to our Facebook followers, and before the promotion ended we had filled all 6 of our full-time memberships and gained several part-time members as well. Now, we have a thriving community of creative and entrepreneurial folks working together to make it matter, and we see a hugely bright future ahead.